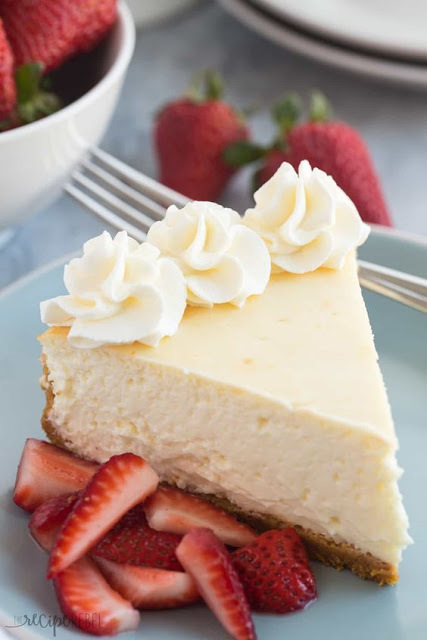 This Vanilla Cheesecake is super creamy and not as heavy as traditional baked cheesecake thanks to a good dose of sour cream -- it's soft and luscious and perfect with fresh berries! Preheat the oven to 325 degrees F and lightly grease a 9" Springform pan. In a medium bowl, combine graham cracker crumbs, melted butter and sugar. Press into the prepared pan and up the sides about 1 inch up the sides. Bake for 12-15 minutes or until firm no longer moist. When done, reduce the oven heat to 275 degrees F.
Meanwhile, prepare your filling. In a large bowl, beat cream cheese until smooth. Add sugar, eggs, lemon juice, vanilla and salt and beat on low speed until smooth.